Start off your visit on the 15th (Mon): explore the ancient world of Palatine Hill. Here are some ideas for day two: admire the striking features of Vatican Museums, then admire the masterpieces at Sistine Chapel, and then pause for some serene contemplation at St. Peter's Basilica. 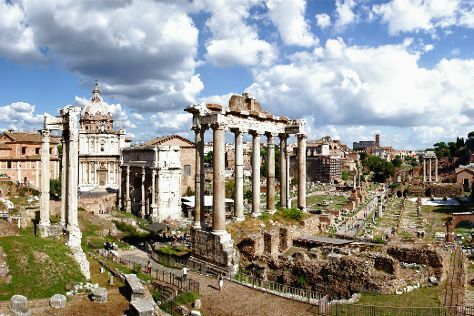 To see ratings, where to stay, more things to do, and tourist information, read our Rome day trip tool . Riyadh, Saudi Arabia to Rome is an approximately 7.5-hour flight. You can also do a combination of flight and train; or drive. Due to the time zone difference, you'll gain 2 hours traveling from Riyadh to Rome. When traveling from Riyadh in July, plan for little chillier days and cooler nights in Rome: temperatures range from 37°C by day to 24°C at night. Wrap up your sightseeing on the 17th (Wed) early enough to drive to Assisi. On the 18th (Thu), take in the spiritual surroundings of Eremo delle Carceri, contemplate in the serene atmosphere at Basilica di Santa Maria degli Angeli, pause for some serene contemplation at Basilica inferiore di San Francesco d'Assisi, then take in the spiritual surroundings of Basilica di Santa Chiara, and finally take in the spiritual surroundings of San Damiano. To find reviews, traveler tips, more things to do, and tourist information, go to the Assisi trip itinerary planner . Traveling by car from Rome to Assisi takes 2.5 hours. Alternatively, you can take a train; or take a bus. Traveling from Rome in July, you can expect nighttime temperatures to be a bit cooler in Assisi, with lows of 20°C. Cap off your sightseeing on the 18th (Thu) early enough to go by car to Florence. On the 19th (Fri), examine the collection at Galleria dell'Accademia, get engrossed in the history at Basilica di Santa Croce, get to know the fascinating history of Piazza del Duomo, then contemplate the long history of Cathedral of Santa Maria del Fiore, and finally explore the world behind art at Uffizi Galleries. Get ready for a full day of sightseeing on the 20th (Sat): snap pictures at Ponte Vecchio, take some stellar pictures from Basilica San Miniato al Monte, then don't miss a visit to Piazzale Michelangelo, then see the interesting displays at Pitti Palace, and finally take in the spiritual surroundings of The Baptistery of St. John. For traveler tips, maps, reviews, and tourist information, read our Florence trip website . You can drive from Assisi to Florence in 2.5 hours. Other options are to take a train; or take a bus. In July, daytime highs in Florence are 35°C, while nighttime lows are 21°C. Cap off your sightseeing on the 20th (Sat) early enough to catch the train to Venice. 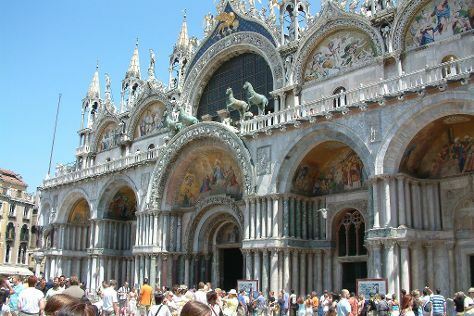 Kick off your visit on the 21st (Sun): admire the landmark architecture of Basilica di San Marco, then snap pictures at Ponte dei Sospiri, then admire the landmark architecture of Doge's Palace, and finally get to know the fascinating history of St. Mark's Square. For photos, where to stay, ratings, and tourist information, read our Venice travel route planner. You can take a train from Florence to Venice in 2.5 hours. Alternatively, you can drive; or take a bus. In July, daily temperatures in Venice can reach 36°C, while at night they dip to 22°C. Wrap up your sightseeing by early afternoon on the 22nd (Mon) to allow enough time to travel back home.